Who would imagine Gutenberg and Marie Curie cooperating on the invention of the automobile? If Edison, Hippocrates and Fibonacci had worked together on the hourglass, which one of them would have claimed ownership of it? Would Tesla have become famous if he has invented the zeppelin? From the invention of fire to that of the light bulb, from Aristotle to Einstein, Legendary Inventors invites you to revisit the history of technological progress. 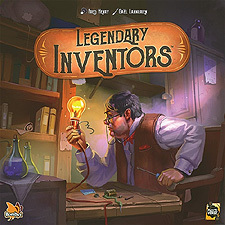 Each player has a team of inventors. Send one of your inventors out to work on an invention. Share the rewards once the invention is completed. Improve the knowledge of your inventors.